After what must have felt like a week from hell – four straight losses, Roberto Luongo yanked in consecutive games, Brendan Morrison injured (and out for the season) and outscored 14-7 in those same four games – the Canucks came out looking like men on a mission in their game against Northwest Division rivals the Calgary Flames Sunday night. It was in stark contrast to their disinterested play of late. 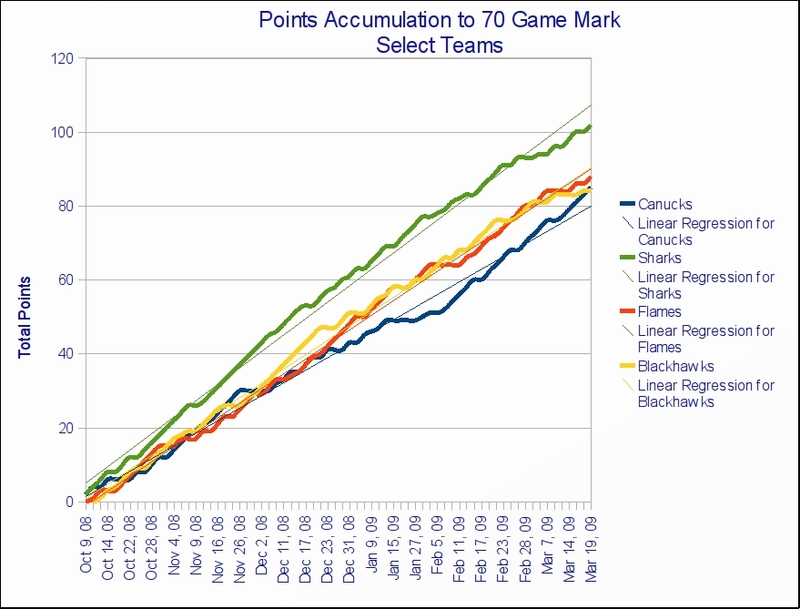 It’s become a cliche to call every single Canucks game a “must-win”, however there are few other phrases that do justice to the magnitude of Sunday’s tilt: the Canucks had nonchalantly dropped into ninth spot in the Western Conference with just four games remaining, all against Northwest Division teams. With five games remaining, I’d speculated they’d need to win three, but more probably four, of their final five games; they promptly lost the first one 4-0 to the Minnesota Wild. Now, with four left, they were up against a team which had out worked, out shot, out muscled and out scored them just five days prior (a 3-2 loss in which the Canucks blew a first period 2-0 lead). The Vancouver Canucks are certainly playing consistent hockey: at a time when they need wins more than they ever have all season, they’ve managed to string together a four game losing streak while playing with the intensity of a beer league club. The Canucks’ indifferent play has, of late, even extended to the once ultra-competitive Roberto Luongo – once again, in a critical game against Northwest Division rivals the Minnesota Wild, Luongo made it to just past the half way mark of the game before being replaced by Curtis Sanford. It was the second straight game Luongo’s been yanked. Roberto Luongo gave up four goals on just 21 shots – that’s an 0.809 save percentage – better than the 0.783 Luongo recorded against Colorado Wednesday, but nowhere near his season save percentage of 0.920 – fifth best in the league. 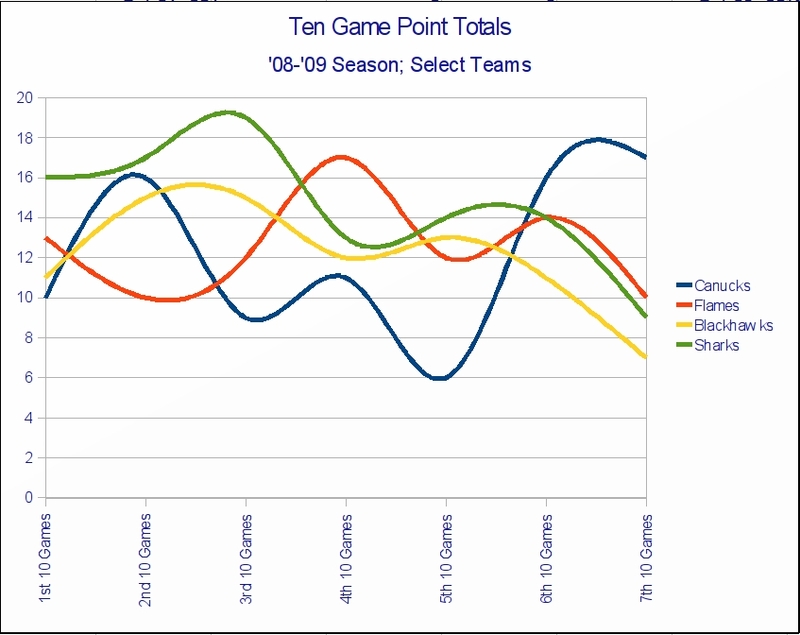 If Luongo is off his game, the Canucks flat out don’t have a chance – they’re a defense based team built around Luongo; they’ll never be a run-and-gun offensive power house. Lately Roberto Luongo’s play is reminiscent of the Dan Cloutier era, and just when you thought Vancouver finally had a goaltender they could rely on game in, game out. The Canucks’ game against the Wild Friday isn’t worth spending too many words on – the Canucks failed in every aspect of their game. Their power play was an impotent 0-5 (Minnesota: 2-4). They were out shot 30-28. They were out scored 4-0. They fell out of a playoff spot and into ninth place in the Western Conference with 86 points, the same number of points Edmonton now has. They looked like a team looking forward to hitting the links, not the playoffs. Next game: Sunday, March 30th, 7pm PST against the Calgary Flames. Needless to say, it’s a must win for Vancouver. The Vancouver Canucks are playing like a team which neither wants, nor deserves, to be in the playoffs. Over the past two games, in back-to-back nights against the Calgary Flames (a four-pointer that could have seen the Canucks in a tie with Calgary for second) and the Colorado Avalanche (a game in which the winner moves to the seventh spot in the Northwest Division), Vancouver went ahead early, only to blow the lead and ultimately lose the game. Against Calgary, the Canucks scored two goals within 12 seconds before the half-way mark of the first period (Naslund with just his 24th of the season (and first in 15 games!) on the power play and Daniel Sedin with his 28th on an impossible-angle bank in from behind the goal line). Vancouver out shot Calgary by a whopping 21-7 margin. That should have left Calgary feeling a bit demoralized and ripe for the finishing blow. Instead, the Canucks took the rest of the night off and the Flames came out in the second and third periods looking like a team that not only wants a shot at the playoffs but is willing to fight, hard, to get there.